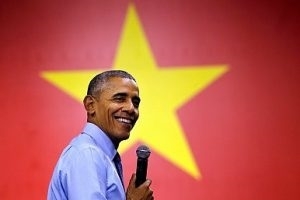 U.S. President Barack Obama began his three-day visit to Vietnam on May 22. This visit is believed to have given an edge to Vietnam in the South China Sea disputes as part of the larger confrontation between the United States and China. It is, therefore, important to reassess the position of Vietnam in the United States’ overall strategy in the region. For Washington, the war in Vietnam was seen as the key to prevent the “domino effect” of communism. This theory speculated that, should one country in a region fall under the influence of communism, the neighboring countries would subsequently follow suit, like dominoes toppling one after another. As a result, the Vietnam War was considered a legitimate intervention by the United States to prevent the communist takeover of South Vietnam and subsequently Southeast Asian countries. U.S. involvement in South Vietnam was part and parcel for the U.S. Cold War containment policy. Vietnam was turned into a proxy battlefield, where North Vietnam was supported by the communist bloc of the Soviet Union and China, and South Vietnam was supported by the United States. At the time of Vietnam War, Vietnam was a young independent country, gaining independence in 1945 only to be interrupted again by the French in 1946, and then having to continue the war for unification without any break after the Geneva conference in 1954. Vietnam in the 21st century is a politically stable country with positive economic development. Vietnam is a dedicated member of ASEAN and has established a wide network of diplomatic and economic relations around the world. Being geographically next to China, possessing an organic connection with Chinese and ASEAN economies, and appearing as one the two strongest claimants of territory in South China Sea, Vietnam holds a strategic position if the United States has the intention to contain China. Thus, Vietnam has again become a vital element in the new U.S. containment policy at three levels. At the economic level, Vietnam is included in the Trans-Pacific Partnership, a macro free trade agreement, whichintentionally leaves out China. At the diplomatic level, Vietnam is important in supporting the Philippines’ arbitration case against China regarding the disputes in the South China Sea and for emphasizing the cooperation of ASEAN countries as a legitimate regional forum. At the level of military containment, the United States has recently lifted the arms embargo on Vietnam and increased financial support for Hanoi’s maritime self-development. The fact that Vietnam is the only country involved in U.S. containment policy at all three levels (the Philippines, for example, is not included in TPP and Japan is not within ASEAN or involved in the legal case against China) shows the importance of Vietnam in the new U.S. containment policy, which is a great evolution from its unfavorable position during Vietnam War. The first striking evolution of Vietnam’s position in the U.S. containment policy was the upgrade of Vietnam’s status from being Washington’s enemy to a strategic partner. During the Vietnam War, Vietnam was targeted by the United States as a key to stop the “domino effect” of communism in Southeast Asia. Vietnam went through a deadly and destructive war with the Americans to achieve unification of the country. The country became well-known worldwide for being able to resist the advanced, high-tech power of the United States, and thereby completely shook Washington’s foreign policy with the so-called Vietnam syndrome. However, in the 21st century, the position has changed dramatically. After the increasing aggression of Chinese claims in the South China Sea, the U.S. made a decisive decision to partially lift the arms embargo which had been imposed on Vietnam since 1984. Furthermore, Vietnam is also included in Washington’s new Southeast Asia Maritime Security Initiative, which aims to upgrade the ability of eight ASEAN countries to manage maritime challenges in the South China Sea. Most remarkably, Vietnam is included in the Trans-Pacific Partnership, the U.S. answer to the Chinese initiative of “One Belt, One Road.” TPP is considered by some as an obvious attempt by the United States to contain China, due to the agreement’s deliberate omission of China despite its important role in trans-Pacific trade. The absence of Philippines in the list of TPP partners is also noticeable. While the Philippines is Washington’s close ally in ASEAN, with a defense treaty obligating the U.S. to protect the Philippines in case of attack, Manila is not included in TPP – but Hanoi is. This very fact shows that Vietnam is becoming more essential in the U.S. containment strategy for China. Part of the reason for this change is that Vietnam enjoys a more independent position in the South China Sea disputes than it had in the Vietnam War. Back then, Vietnam was a small, newly-independent country, with few resources to manage the war with a U.S.-supported South Vietnam. The target of U.S. containment policy at the time was the Soviet Union and communism. However, the United States allied with China to take advantage of the crack in the communist bloc, changing the structure of U.S.-Soviet-China relations. In the early 1970s, tension between two big communist states created the opportunity for the United States to intervene. The so-called “opening to China” process started after President Richard Nixon’s trip to China in 1972, greatly improving the diplomatic relations between the U.S. and China. At that point, the United States could negotiate with China, persuading Beijing to limit support for Vietnam and the Soviet-Vietnam link. In the first negotiations between the United States and the People’s Republic of China, the Vietnam War was one of the two important topics discussed, along the Taiwan question, as Henry Kissinger noted in On China. Vietnam was turned into a bargaining chip and the triangle of U.S.-China-Vietnam relations became a key in U.S. containment policy. In that triangle, Vietnam was the most vulnerable. The United States wanted to take advantage of diplomatic opening with China to quickly finish the Vietnam War, while China wanted to use Vietnam to bargain and gain more standing in U.S.-China cooperation against the Soviet Union. South Vietnam, or the Republic of Vietnam, was directly supported by the United States – but despite that close relationship, Washington forbade the South Vietnam government from bombing the PRC when China took control of the Paracel Islands in the South China Sea. And China was ready to reduce support for Vietnam, like it did in the 1970s, if it was beneficial for U.S.-China relations against the Soviet Union. Vietnam was stuck in the middle, used as bargaining chips by big powers. Vietnam at the time had little means to decide its own destiny. However, in the South China Sea dispute today, as an independent state, Vietnam has more space to develop its own position. That is not to say that Vietnam is completely independent from the influence of the United States or China. However, Vietnam can to some extent manage the level of cooperation and relations. For example, after peaking disputes in South China Sea, the Chinese government always has to follow up with diplomatic visits and attempts to reconnect relations. Xi Jinping visited Vietnam in October 2015, at a very sensitive point in their relationship. Though more symbolic than substantive, Xi’s visit showed that China did not want Vietnam to completely drift away from Beijing. On the other hand, Vietnam can also actively initiate and encourage military and political advances with India, Japan, and the United States to balance the relation with China. The way Vietnam perceives itself in international relations, especially in the U.S-China-Vietnam triangle,dramatically affects the position of Vietnam in U.S. containment policy. In the past, the world was bipolar. Vietnam chose to be in the communist bloc and subsequently fell into a proxy war with the United States. There was no middle ground; Vietnam could not simultaneously ally with the Soviet Union and the United States. That power structure has changed. The new world is multipolar. U.S. hegemony has been undergoing a considerable decline relative to new emerging powers such as China, Japan, Australia, Germany, India, and so on. In the new world order, Vietnam has the chance to choose a variety of alliances and avoid falling into direct confrontation with either the United States or China. Undoubtedly, Vietnam could have chosen to side completely with the United States, like Japan and the Philippines. However, Vietnam decided to commit to a more flexible position. Vietnam cautiously avoided a direct confrontation with China by not following the Philippines in taking Beijing to court for violations in the South China Sea. Obviously, there is pressure from China for Vietnam not to join the Philippines’ case, but Vietnam was also aware that a court case would not work in favor of its geopolitical position. Vietnam prefers a balance between the United States and China rather than making straightforward commitments with either of the two superpowers. Rather than totally allying with big powers like Russia, China, or the United States, Vietnam is simultaneously trying to enhance cooperation with many countries, such as Russia, Japan, India, and Australia. Many scholars give ASEAN special attention as Vietnam’s most favored form of balancing or containing China. While the future cooperation of ASEAN to speak as one voice on the South China Sea issue remains doubtful, ASEAN is expected to provide the most legitimate power and commitment for ensuring conduct in the South China Sea. Such a multi-dimensional outlook offers Vietnam more space and flexibility to partly form its own position and while keeping its importance in the U.S. containment policy centered on the South China Sea dispute. Self-development is the only way for Vietnam to insulate itself from the influence of major powers’ clash. Vietnam is a small country stuck in the middle of confrontations by superpowers — in the past between the United States and USSR, and currently between the United States and China. Vietnam’s geopolitical position shaped the fate of the country as relates to U.S. containment policy in both the Cold War and today’s South China Sea dispute. In the 21st century, Vietnam has again become an element in U.S. containment against China. However, this time around Vietnam has been quite flexible in adjusting its position in the U.S. containment strategy. Vietnam’s foreign policy on the South China Sea issue is an example of the evolution of an independent and pragmatic state. Being China’s neighbor, but with a long history of fighting against Chinese influence, pushes Vietnam into an extreme dilemma. On one hand, resisting China is the core of Vietnamese identity and nationalism; it is almost impossible for Vietnam to submit to Chinese supremacy and bandwagon with China. The two sides’ cooperation under the communist bloc already marked the best period in Vietnam-China relations. On the other hand, bordering China does not leave Vietnam the chance to ignore Chinese power and completely commit to a strategic partnership with the United States. After the liberation of 1975, Vietnam has always tried to balance relations between the U.S. and China, being careful not to anger China by over-intimate dialogues with the Americans. Given the interdependence in the new world order, Vietnam cannot expect any committed support such as it received from the Soviet Union. The best position for Vietnam in the U.S. containment policy up till now is to stay flexible, multilateral, and independent. However, such a strategy is not sustainable. Already, Vietnam is struggling to balance relations with China and the United States, in addition to being on the verge of losing its claimed territory in the South China Sea. Developing its economy and improving Vietnam’s internal situation is the only sustainable method for having a position in the South China Sea dispute. Otherwise, Vietnam will again lie at the mercy of the great powers’ game./.